A true rebel requires something decent to push back against. In the case of Braveheart it was the unjustified genocide of his people at the hands of the English. With that being a pretty reasonable cause the license to push back is not only granted, but encouraged. Unfortunately for William Wallace (Mel Gibson) he was too young to make a difference when the incursions began, taking his father and brother and countless other Scots. The Scots in these times were brave and noble but hardly united, and while the tales of English brutality abounded, most merely hoped that the violence wouldn’t arrive on their doorstep. Futile wishes. One village at a time the English stomped loudly. They picked off the rowdy and the violent, and subjugated a nation in a deliberate and blood soaked procession. With the Scottish spirit subdued and an English presence maintaining the pressure, young William left to England himself, not to wage battle or negotiate, but to learn the ways and the weaknesses of his inevitable foe. He returned with wild hair and a steely eye to a still beautiful lush green land which was nonetheless living under the grey skies of oppression. Within days Wallace caught the eye of a comely lass he once knew as a boy. Married in secret, they committed to making the best of the situation. The English didn’t pay attention to the wedding vows. ‘Twas the death of his woman that lit the freedom fire beneath Wallace’s kilt. His immediate act of retribution was heard across clans. His defiance leading to greater vigilance and eventually unity, through hatred of a common enemy. Eventually, though still greatly outnumbered, less organised and more sparsely armed, the Scots form an army under Wallace, with some nifty speeches and natty blue and white face paint merely adding to the legend. With betrayal being constant and especially heart wrenching, the only truth lies in battle. Here Wallace – and the film – flourishes.The first pitched hand to hand battle is especially bloody and brutal. Like Wallace it takes no prisoners, leaving behind a bloody paddock strewn with death. This is only the first of many, with each tentative agreement leading to more betrayal and bloodshed. If William Wallace can be summed up in two words they would be ‘too trusting’. 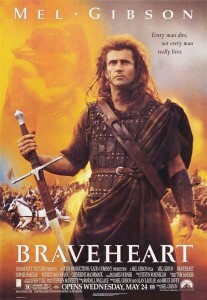 Braveheart succeeds because it pleases everyone and justifies it all for both genders. Females love the rippling biceps and flowing locks. They love the true love and the magnificent scenery. And once Wallace’s m’lady is taken, I am positive that no repercussions applied in the name of vengeance could be too great. Guys like the kilt jokes and fights. No one should find mirth or enjoyment in how everything ends, but the excruciating closing sequences give an already good film more power and gravitas. They build upon the legend of William Wallace, and even if the accusations from historians that the accuracy of many of the events depicted are fanciful at best, ring true, they cannot dilute the effectiveness of the film. Mel Gibson never again recaptured the essence that made this film so accessible -regardless of how much money his crucifixion fiction made – but these are undeniably the three most powerful hours of his directorial career. Final Rating – 8.5 / 10. For all of Mel’s wrongs, he gets this right.